The engineer operating the Amtrak train that derailed last month told investigators that he didn’t see signs and signals indicating a lower speed limit at the curve near where the crash occurred. The engineer on the Amtrak train that derailed south of Tacoma this past month, killing three people and injuring dozens, said he didn’t see or didn’t recognize the signposts and signals indicating a drastic drop in the speed limit, a new report from federal investigators says. 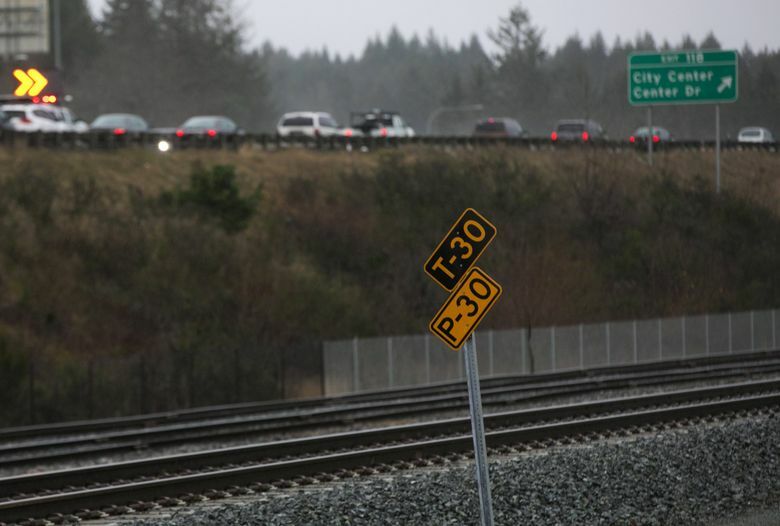 It was the engineer’s second time operating a train in that direction on a newly opened stretch of track, known as the Point Defiance Bypass. The National Transportation Safety Board (NTSB) interviewed the 55-year-old engineer this past week, about a month after the deadly crash. Both the engineer and a qualifying conductor, who was in the locomotive to familiarize himself with the new track, suffered serious injuries, which delayed their interviews, the NTSB said. The train was going nearly 80 mph when it derailed on a curve where the speed limit was 30 mph. It crashed onto Interstate 5 on Dec. 18, closing the southbound freeway for most of three days, wreaking traffic havoc across the region. The new report offers the clearest clues yet as to why the train was traveling nearly triple the speed limit when it derailed, and it could bolster allegations from plaintiffs’ lawyers and others that Amtrak provided its staff insufficient training before carrying passengers on the new stretch of track. 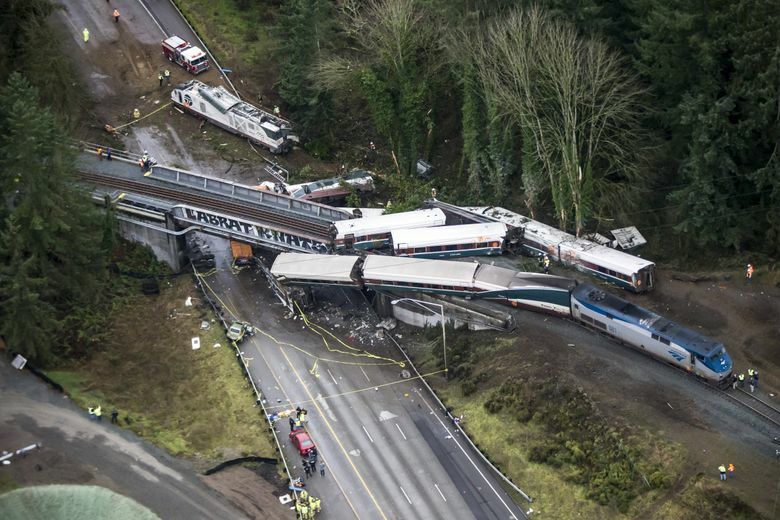 The train, which was on its inaugural run on the Point Defiance Bypass, was carrying 83 passengers and crew members; three passengers were killed and 62 people were injured. In the five weeks before the crash, the engineer, whose name hasn’t been released, had completed seven to 10 “observational trips” in a locomotive on the new stretch of track, the NTSB said. He had also completed three trips in which he was operating the locomotive. Two of those trips were going northbound, the NTSB said. He had completed only one training trip operating the locomotive south — the direction it was going when it crashed. What’s more, when he saw a signal at the curve, he mistook it for a different one. Signs mark the decreased speed limit 2 miles before the curve and right at the curve, which is milepost 19.8. The engineer, who was hired by Amtrak as a conductor in 2004 and was promoted to engineer in 2013, said that when the train passed milepost 15.5 it was traveling at the speed limit, about 79 mph. The engineer said he did see a trackside signal at milepost 19.8, indicating that there was an upcoming junction, but he mistook it for another signal farther north. By the time he saw a 30 mph signpost right at the curve, he applied the brakes, the report says, but by then it was too late. “Seconds later, the train derailed,” the report says. American railroads don’t have flashing yellow lights or similar warnings before a hazardous curve — as vehicle drivers might see on rural highways. Instead, engineers must rely on seeing signs and knowing the corridor speeds as described in railway manuals and orders they carry in the locomotives. A few Eastern railroads have alert systems, where a track sensor sets off a signal in a locomotive that a slow zone, such as a curve, is coming, said John Hiatt, a railway litigation investigator. “Why not have a trackside warning, which is a very simple system? It just goes off with an in-cab signal,” Hiatt said. Such alerts can protect short segments at far less cost than the regional, satellite-based Positive Train Control (PTC) system that isn’t finished yet. PTC was supposed to be operating throughout the United States by late 2015, including on the line where the Amtrak derailment occurred, but Congress extended its deadline to 2018. These systems for Amtrak in Washington state are near complete or undergoing tests. Peter Knudson, an NTSB spokesman, said investigators were analyzing Amtrak documents to determine further details on the engineer’s training: Were his training runs daytime or nighttime; group or individual; in the front or rear locomotive? After the crash, Amtrak workers expressed concern about the adequacy of the training they received on the new track, according to a person briefed on the matter who requested anonymity because they were not authorized to discuss it. The workers, the person said, were concerned that engineers had been piled into a single locomotive to do training runs as a group; that conductors were largely kept in cars farther back in the train or on the trailing locomotive; that some did their familiarization runs in the dark after midnight; and that supervisors were unwilling or unavailable to answer questions about key route characteristics such as speed. The engineer told investigators that he felt rested at the start of his Dec. 18 shift and that he didn’t think it was a distraction to have the qualifying conductor in the locomotive with him. That conductor, Garrick Freeman, has sued Amtrak, alleging the railroad failed to provide safe working conditions. Freeman’s lawyer, Anthony Petru, also said that workers had described group training for engineers and conductors training at night and in the rear locomotive. The lawsuit is one of several pending against the railroad and other related agencies stemming from the crash. Freeman told investigators that the engineer appeared alert during a briefing at the start of their shift and while driving the train. He also said there was “minimal conversation” between himself and the engineer during the trip.